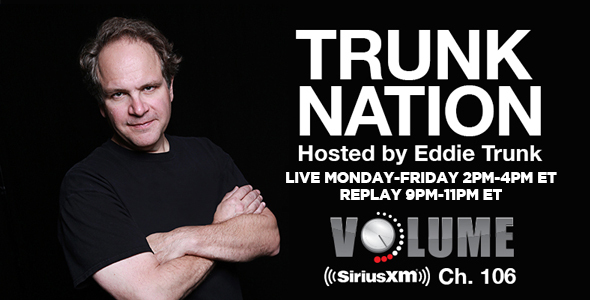 TUNE INTO “EDDIE TRUNK LIVE,” A WEEKLY LIVE RADIO SHOW ONLY ON Sirius/XM SATELLITE RADIO. IT IS LIVE NATIONWIDE, COMMERCIAL FREE AND UNCENSORED. EVERY MONDAY 6-10PM EST, 3-7PM PACIFIC ON CHANNEL 39 HAIR (TRUNK) NATION! TUNE IN TO HEAR THE BEST IN HARD ROCK/HEAVY METAL, LISTEN AS EDDIE INTERVIEWS THE BIGGEST ARTISTS OF THE GENRE, AND TAKE PART IN THE SHOW AS EDDIE TAKES YOUR CALLS LIVE! THE LIVE CALL IN LINE IS 866-315-2663. ALSO JOIN EDDIE TRUNK DAILY MONDAY-FRIDAY LIVE 2-4PM ET ON SIRIUSXM CHANNEL 106 VOLUME TALKING ROCK MUSIC! CALL IN AT 844-686-5863 FOR TRUNKNATION ON VOLUME. THIS SHOW ALSO REPLAYS EVERY NIGHT 9-11PM ET AND IS AVAILABLE ON DEMAND ON THE SIRIUSXM APP. NOT A Sirius/XM SUBSCRIBER? GO TO WWW.SIRIUSXM.COM FOR MORE INFO/DETAILS.